Whoo hoo! My first quilt for our bed is almost complete! Yes, I said first! 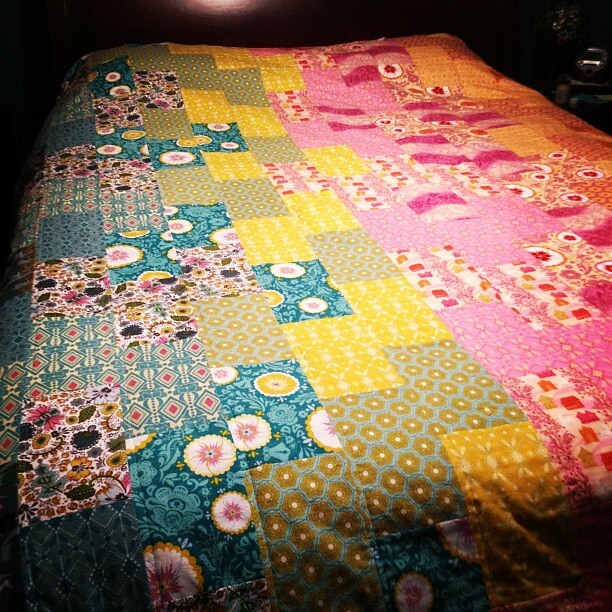 I've made almost 100 quilts and I have never made one for my own bed! Scandalous! 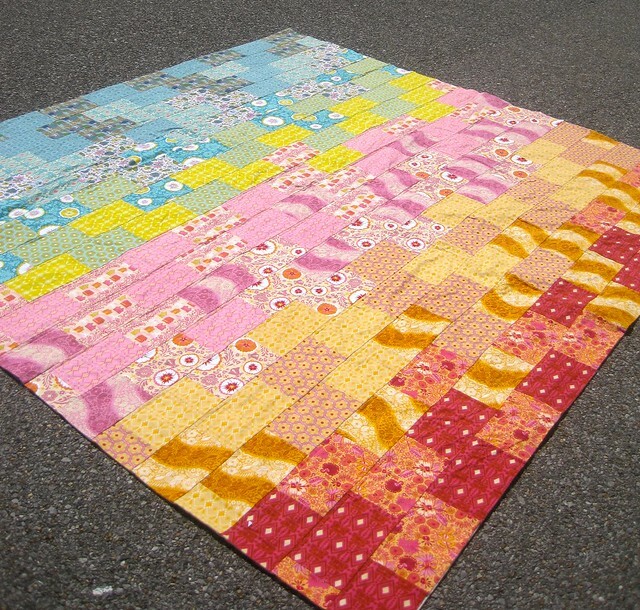 Anywho, this is made entirely of the super yummy AMH Folksy Flannel line and I made a simple brick path pattern. This allowed me to have a "his" and "hers" side--which was important because my hubby would not have slept under a pink quilt. He has his standards. :) The back is ENTIRELY VOILE!!! You heard me! Almost 8 yards of delicious AMH Little Folks voile! I promise to have more pictures soon!!! I'm so excited for this one! P.S. It was a freaking b*&$h to quilt this sucker! Me + queen sized quilt + straight line quilting = misery! Love it! I've never seen the his/her side idea! Beautiful! Can't wait to see more pics. It is beautiful! I love the his and hers sides idea. You must be so excited and proud. yay for you! It looks awesome! Bet it feels even more wonderful! Gorgeous! Congratulations on the finish! This looks fabulously soft and wonderful. 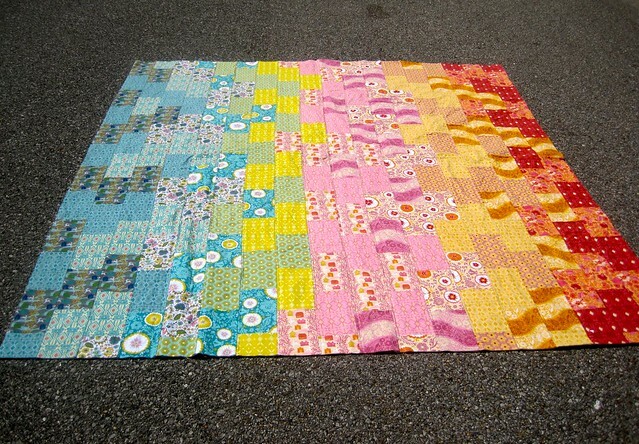 Love these bright cheery colors! It's awesome. I am so happy for you and jealous. I was laughing about you having made 100 quilts, but not one for your own bed. 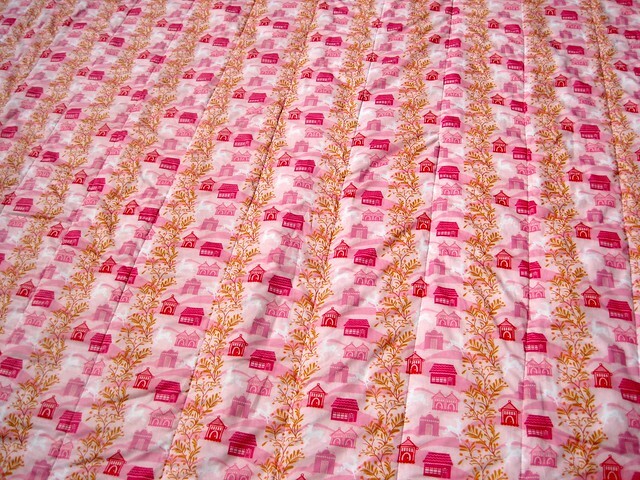 I have probably made 20-25 quilts, and yet only one of our beds is covered by something handmade by me. But it's my son's bed, not mine! I think I keep waiting for the perfect idea before I tackle our bed. I need to get over it. Ha! The his/hers idea is so fun. I'm glad you finally have one of your own, K! Oh how gorgeous, love it, and the 'his and hers' idea too!